Women’s World Banking has conducted more than a dozen Women in Leadership (WIL) training programs around the world and each workshop manages to surprise and move us in different ways. In Mexico, our group of high-performing women from microfinance institutions across Latin America and the Caribbean went back to basics and reminded us that underneath all the theory and tactics of leadership, we must first know and embrace ourselves as individuals and as leaders. Women’s World Banking’s WIL helps participants to build core leadership and management skills including listening and questioning, negotiation, building networks of support and influencing others. It also leads participants through a process of self-discovery of their authentic leadership voice and supports them in creating a personal leadership vision and action plan to make this vision a reality. A very powerful benefit of participating in WIL is something less tangible—inspiration. Women from different countries, backgrounds, and job functions come together and share their stories of triumph and tribulation with each other. By creating a space for reflection and open dialogue they see that they are not alone in their struggles or dreams. Meeting other strong, successful women encourages participants to view themselves as leaders, some for the first time, and to pursue their visions of success. WIL Mexico was unique in another way. We had the honor of having senior women leaders from the program sponsor MetLife participate in part of the program. 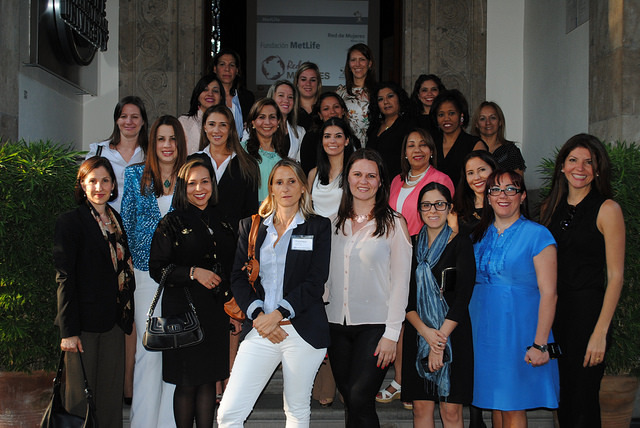 Apart from sponsoring WIL Mexico, MetLife sent a contingent of their own high-performing women to the workshop, highlighting the organization’s investment into leadership and gender diversity. The two groups spent the afternoon reflecting on styles and preferences using the Myers-Briggs Type Indicator (MBTI), a key component of all WIL programs. Commenting on the MBTI, a participant representing Women’s World Banking said that, “having the opportunity to learn from the experiences of other leaders helped to open my mind and understand other ways of thinking.” Participants were struck by the enthusiasm, openness and authenticity of the women leaders from MetLife. One of the stories that made a particular impact on our participants came from, Carolina* a member of the MetLife team. Carolina is a successful lawyer who says what is on her mind and doesn’t hold back. Upon meeting her, one is immediately struck by her energy, self-confidence and intellectual curiosity. When participants were asked to share final thoughts at the end of the MBTI session, Carolina said the session reassured her that her unique contributions, based on her best self, are valuable and important. She paused and added that she had not always felt this way. In fact, early in her career, people told her not to be herself because her natural preferences did not fit with the stereotypical image of a lawyer, and particularly a woman lawyer: someone who should be reserved, serious and conventional. She told the group about her inner battle, between who she knows she truly is and what other people want her to be. Finally, after coming to know herself, she had made a bold decision to use her natural strengths and not hide them to fit someone else’s mold. Ultimately, being true to herself is what led her to be the accomplished professional that she is today. The whole room was moved by her story, and it resonated very strongly with our participants who all agreed that they also often feel pressure to conform to a certain ideal of being a woman. The MBTI session, and sharing experiences with their colleagues from MetLife, helped the participants to realize that when you are good at your job, no matter what our personal style or preferences, you can be successful. You don’t have to be anyone else but yourself—and once you accept and embrace who you are, you will be a more authentic and effective leader. The leaders who attend Women’s World Banking’s workshops often ask us whether leaders are born or are made. Our philosophy aligns with that of Young & Rubicam chairman and CEO Ann Fudge: “all of us have the spark of leadership in us…the challenge is to understand ourselves well enough to discover where we can use our leadership gifts to serve others.” The journey towards leadership starts with yourself. Participants begin this journey by looking back at the skills and passions that have brought them to where they are today. Taking this history as a starting point, they begin to construct a future leadership story. However, knowing yourself, your strengths and areas for development, is not enough. You need to know your team and build a diverse network of support. Carolina is lucky—she is part of MetLife, a company that knows how important it is to support and promote women’s leadership and diversity—but she could not be the leader she is today without embracing herself to be a true, authentic leader. Now that she and over 30 other women leaders are connected with each other, they can continue inspiring and supporting each other. MetLife Foundation was created in 1976 to continue MetLife’s longstanding tradition of corporate contributions and community involvement. Today, the Foundation is dedicated to advancing financial inclusion, helping to build a secure future for individuals and communities around the world. Click here to download an overview of our new mission.